Rice balls, onigiri or omusubi, may be Japan’s greatest comfort food. I wrote about onigiri for a column on Japanese breakfast in Tokyo for The Japan Times. Omusubi Gonbei is a short walk from Shibuya station. 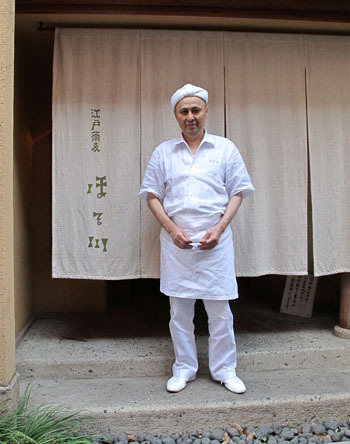 Kuoesu is the rare kaiseki restaurant that is open for breakfast. It is a long walk from Hiroo station, but worth the journey. The set morning meal starts at 900 JPY, so without the kaiseki prices. I was greeted by a female chef who guided me to the quiet counter. I was the first diner this morning and loved the peaceful setting. She worked in the back kitchen so I had the whole dining room to myself. She first came out with tea and an oshibori (wet towel). Then came the tray with five dishes: rice, miso soup, turnip and cucumber nukazuke (rice bran pickles), red-veined spinach lightly blanched and deep-fried hamo (conger eel). The last was a large round earthenware dish, almost as big as the tray, with a charcoal-grilled managatsuo (pomfret) and grated daikon. The meal was colorful and nutritious. My favorite was the rice, which was a revelation. It was very firm, almost al dente. The chef told me that it is cooked in an cast iron pot with a small amount of water. There is also a menu for supplemental dishes like omelet and nattō. As I finished my meal she was setting up a few more settings. I wish I lived closer, but it is worth making a special trip across town. Reservations are required. This first appeared in my monthly column for The Japan Times on Japanese breakfast. Robbie Swinnerton introduces Hosokawa Soba in Ryogoku. This soba-ya looks like it worth the trip across the Sumidagawa.